Manufactured in Allemagne from 1904 until 0. The camera presented is out of metal, which locates it between 1904 and 1909. It is of klapp type to tensioners. It is provided with a Carl Zeiss Tessar lens of 136mm opening with 1: 6.3. The shutter is with plane focal curtain from 1/15 to the 1/1000 of second. 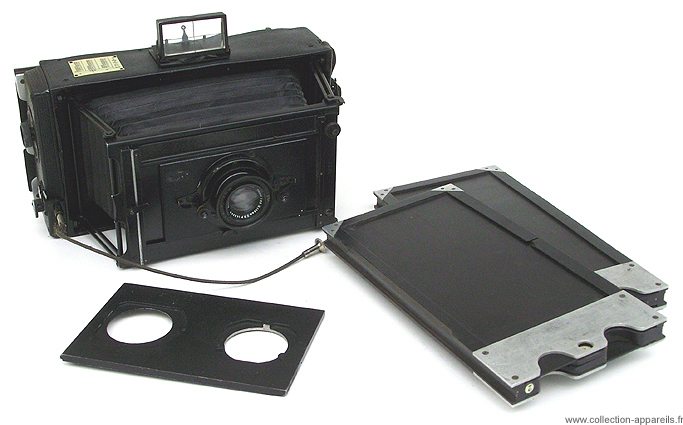 This camera allows while changing lens plate, to have a camera with double function: either stereo, or panoramic, an internal separation starting again the accordion of the bellows having to be positioned according to the cases. To note the origin cable release “clamping” itself on the body.